These are the edge points of our hive entrance. At each of these points, use a square to draw straight lines 5cm (1 15/16″) long at right angles to the edge of the board. Using a straight edge, draw a line connecting the two edge lines to form a rectangle. When finished, your board should look similar to the one below. Now cut along the two 5cm (1 15/16″) lines with a handsaw or table saw. Stop each cut at the end of the line. See the picture for details. Take a chisel and remove the extra wood between the two cuts. When finished, you may want to use some sandpaper to smooth out the chiseled area. Congratulations on preparing all the floor parts! Go on to the next page where we will build the main floor assembly. What is the angle of the hive entrance? john – Good question! I don’t cut my hive entrances to an exact angle, but my average is about 45 degrees. Bees can crawl up a 90 degree angle, so you can do away with the chiseling altogether if you want. abit of a slope in now, another question is , can you or would it be adviseable to make the landing board a little bit wider for the bees to land on? saving afew misses. john – You can add another inch or two if you want to. I don’t usually make any changes to the landing board. Just more adds more work. The legs are sure fancy, but I just use concrete blocks for my hives. This means no wood-t0-ground contact so I don’t have to deal with rot. Also, my hives get closer to the ground. According to Warre himself (and I have witnessed this myself), bees laden with pollen or honey may land on the ground and need to get back up because the weight of their load. The taller the floor from the ground, the harder this is for the bees. Besides, you can usually find some concrete blocks or bricks laying around somewhere and they are easy to level — just dig the dirt around the bricks until you get it the way you want. Put the floor (sans feet) on the bricks or blocks and you are good to go. Logan – Actually, the legs on the beehive are not that tall…in fact they are the exact height Emile Warre recommends on page 46 of “Beekeeping for All” Concrete blocks can transfer moisture to your beehive, so I don’t like to use them that much. They do provide a very solid base though. It doesn’t matter. I built two Warre’s like you mentioned, and both refused to build down when I added a new box underneath according to the Warre method. I even baited one by bringing a comb down and they still wouldn’t go. My Kenyan Top Bar Hive is performing beautifully, so I’m sticking with Langstroths and horizontal top bar hives. Sorry, but in my experience Warre isn’t worth the effort. I’ll be giving away my Warre boxes with the observation windows. Nice site, I hope others have better luck but I don’t want to do Warre boxes any more. so will the bees build their comb down on to the bottom board? Also, do we need a queen excluder? And are there construction plans for the bee feeder? thanks! 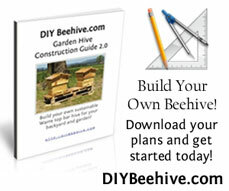 Great site, I am in the midst of building my first Warre hive! Question regarding the landing board. Why does it need to be a long as it is and extend all the way underneath and flush with the back edge of the floor? Seems like it could easily be have that length. Great site, answered a lot of questions for an inexperienced woodworker like me. Thanks for the effort! Hi Ellis. I have a plan in the works, I just haven’t had a chance to finish it yet. I hope to have it done in the next month so keep checking back. I tried a couple of years ago with a long Top Bar Hive, with a few frames of bees, but it did not go too well. They did not make it through the winter. The Warre Hive seems like it will be much cozier for the bees, So I am going to try again and hope to get a better start. If you are just beginning with your Warre Hive – should you use Two Hive boxes, as I was thinking, reserving the others, or only use One, as shown in the “installing section” and wait to add the second box? A local Beek has Nucs with mixed race bees but I don’t really want to start my bees already with large Cell frames. Should I try to order from a small Cell supplier, like those mentioned in the Warre Site, or will a regular package with an Italian Queen serve me just as well? I would prefer to pick them up rather than have them mailed. Also with a new Hive, should you start with 2 # or 3# package of bees. I was not certain because the hive is smaller. Do the boxes just sit free atop one another, and the bottom box not secured to the floor? Seems like it could topple over, but to add boxes below you need to be able to lift bottom box away from the floor. Yes, the boxes are stacked up and not secured to the floor. You’ll be surprised at how heavy boxes filled with honey will get plus the bees will bond the hive boxes together with propolis and you’ll have to break them apart. For Bees, check your local Ag society for newsletter/website and advertising. I managed to find several in-state suppliers when I bought my 2 pkg of Bees. I wanted to pick them up and not have them mailed. Installing them is easier said than done (detaching the queen cage & attaching it can be a stinging problem) for your first one any way. I made regular boxes, but after the bees were in I decided I needed to observe them and made m ore boxes. All your relatives and friends will want to take a peek too. My question about the landing floor /entrance is if it all is fairly close to the ground as Im seeing in the photos dont mice have an easy access to the hive ? Hi Russ, there are always intruders that will try and get into the hive (competing hives, rodents, ants, etc…) as long as the hive is healthy the bees will be able to protect themselves. When discussing the floor of the People’s Hive, Emile Warré states: “It is not without reason that we have given the entrance to the People’s Hive the following size: 120×15 mm.” (p.48, English translation). Yours seems to be aprox. 120x50mm. Is there a reason for this? Hi Ricardo, the callout on the wood used is 1″ thick and actually measures about 3/4″. That gives a 19mm opening. I’m not sure where you see 50mm but that would be quite huge! Hi Russ. The size of the entrance depicted here is bigger than the size recommended by Warré, which in my opinion, could be a problem. When discussing the floor of the People’s Hive, Emile Warré states: “It is not without reason that we have given the entrance to the People’s Hive the following size: 120×15 mm. […] Of course, in winter, we reduce this entrance further. A metal entrance has an opening of only 70 x 7.5 mm to prevent the entry of rodents. Moreover, in winter there are not that many bee sorties. This opening serves, so to speak, only for ventilating the hive.” (p.48, English translation). I build my hives with the exact measures suggested by Warré and I haven´t had any problems with rodents so far.